The Bowling Green Hot Rods, Class A Affiliate of the Tampa Bay Rays, will host their annual Fan Fest this Saturday, March 17. The free event will take place from 10 AM to 2 PM at Bowling Green Ballpark and will be highlighted by the launch of 2012 single-game ticket sales. Fans that attend can also enjoy behind-the-scenes ballpark tours, food, prizes, inflatables for the kids, and more. Fan Fest begins at 10 AM with the start of single-game ticket sales at the Hot Rods Ticket Office. Single-game tickets will be available for purchase for any game of the 2012 season, including Citizens First Opening Night on April 5, 15 post-game fireworks extravaganzas, five day games during the week, including Labor Day, and more. Plus those fans in attendance will receive the first look at the 2012 promotional schedule. Tickets will be available at the Hot Rods Ticket Office, by calling (270) 901-2121, or by visiting the Hot Rods website, www.bghotrods.com. Due to an increased demand in ticket packages and large group outings this off-season, availability for select dates is limited and fans are encouraged to purchase tickets early. Fan Fest will also serve as the first opportunity for season ticket and Mini Plan holders to pick up their 2012 packages. 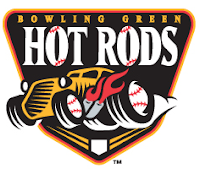 The Hot Rods begin their fourth season with Citizens First Opening Night on Thursday, April 5, 2012, at 6:35 PM against the South Bend Silver Hawks (Arizona Diamondbacks). Secure a free ticket to Citizens First Opening Night by purchasing a 2012 Mini-Plan, which come in 6-Game, 10-Game, and 17-Game options and offer a free hot dog at every game plus other great incentives. For more information, visit www.bghotrods.com or call the Hot Rods at 270.901.2121. Via Press Release from Hot Rods Manager of Broadcast./Media Relations Hank Fuerst. Neither Torra nor Colome had a good day, both had some extended innings early on. I didn't look for stats, at this point it is about getting innings in and staying healthy. Twins started LHP in both games, and with LH dominant lineups both Rays' teams offenses struggled. Sheridan had a long HR and Sexton had a couple solid shots, but overall a tough day for the hometown boys. Brett had a HR in the Thursday game, and some pretty good pitching from both sides. Dixon had a nice throw from LF line to nab a runner trying to stretch, and a couple RBI of Harris, who was flying all over the bases. During one of the innings a swarm (hundreds) of bees passed through like a cloud, don't believe any stings reported, but a bit distracting for sure! Who else threw! Who started? When does camp break and who will probably be in the rotation. Malm going to PC or BG? Thank for the insight Jim. I was able to get over for a little bit today. I just got the few photos and recap done on the little bit I saw.